Òsùmáré is the rainbow or rather the rainbow is the trail Òsùmáré leaves in the heavens, the imi Òsùmáré, literally ‘the discharges of the Rainbow’. The name itself is difficult to break down etymologically, but it is common to see it as a contraction of Olodu and máré, as a direct reference to the eternal presence of the creator. Maré always present the idea of ‘what always will be’. In terms of Òsú this prefix has at times been turned into Èsú, as in Èsúmàré, it will then reveal itself as the principle of eternal transformation or change, which also makes sense. 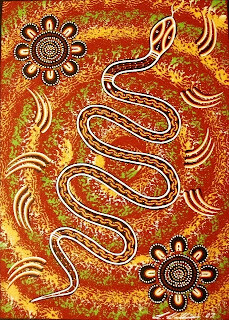 Òsùmáré is related to change in the shape of the ever skin-leaping boa that rests in the heavens. One Yorubá proverb praises Òsùmáré as the eyes of Olodumaré and brings his role and nature in close proximity with the nature of Danballah and Aiyida Wedo, the ancestral serpents of Vodou. Another interpretation has connected Òsùmáré with Òsùpá, ‘the moon’, which also makes sense as it underlines his cyclical function of renewal and restoration of divine order. Personally, I do believe that yet another layer can be unveiled by looking at the antagonism between Sango and Òsùmáré. Òsú means ‘double headed ax’ and is the symbol of Sango. The Òsú carries the ideas of dynamic equality between night and day, between severity and mercy. The òsú is usually shaped in the format of a woman, to signify that a king is no king unless woman has blessed him as such. In Brazil a story is at times recounted about a time when Sango was married to Òsún, the spirit of sweetness, love and beauty. With a growing fear of losing Òsún to the handsome and elegant Òsùmáré Sango calls Òsùmáré to a duel. For several days they fight, Sango flashes his thunder and releases fire from his mouth, while Òsùmáré calls upon the help of the serpents, snakes and vipers and event transforms himself into one. After three days Sangó severs Òsùmáré into two parts, but the creator seeing the great beauty now slain puts him in the sky as a token of divine presence and restitution. In Brazil this story and several others have contributed to this Orisa being called ‘meta-meta’, meaning ‘half-half’ in Brazil, but refer to a triplicity in Yoruba. Clearly this ‘yorubá-term’ is derived from an incorrect etymology by the similarity of ‘meia-meia’, in Portuguese, that means two halves. Anyway, this story might tell us that the name Òsùmáré means ‘he who is made eternal by Sango’s ax’. Òsùmáré traditionally provides wealth and honour. It is an Orisa that is propitiated by people in need for financial stability and in need for recognition. And let it be clear that the ideas Òsùmáré being homosexual or bisexual or pansexual are a deviation from the principle of change. We need to realize that Òsùmáré is the very point of balance between contrasts. He is the power that turns night into day and day into night. He is the power that turns the moon and the cycles of the planets, which is why he sometimes is referred to as ‘Lord of the Stars’ and appointed the milky way as his home. Òsùmáré is the change of fortune by self renewal, the votary must do as the serpent itself and change the skin to embrace wealth and fortune. Òsùmáré and his connection to riches are also told of in the corpus of Ifá, like Owonrinrosun where Òsùmáré is called to the castle of Olokun to rescue the life of his sick daughter. He goes there and saves her. Olokun’s reward was ‘ajé ola’, meaning that Òsùmáré was ‘surrounded with riches’. Hence this opens up for the rich tradition we find in Dahomey related to Dan, the chief serpent as Heviosso’s ladder of descent to earth and the serpents intense relationship with the mysteries of the ocean and wealth. But that is another story… as is his deep relationship with the Orisa Omolu, the Lord of Infectious disease… Òsùmáré manifests in the Ifá corpus in all odu that express total balance, like ogbe-yeku, iwori-di and so forth and is on one orin (song) praised as ‘Awó yo lojú Òrun’, ‘the secret of the heavens appears in the sky’.